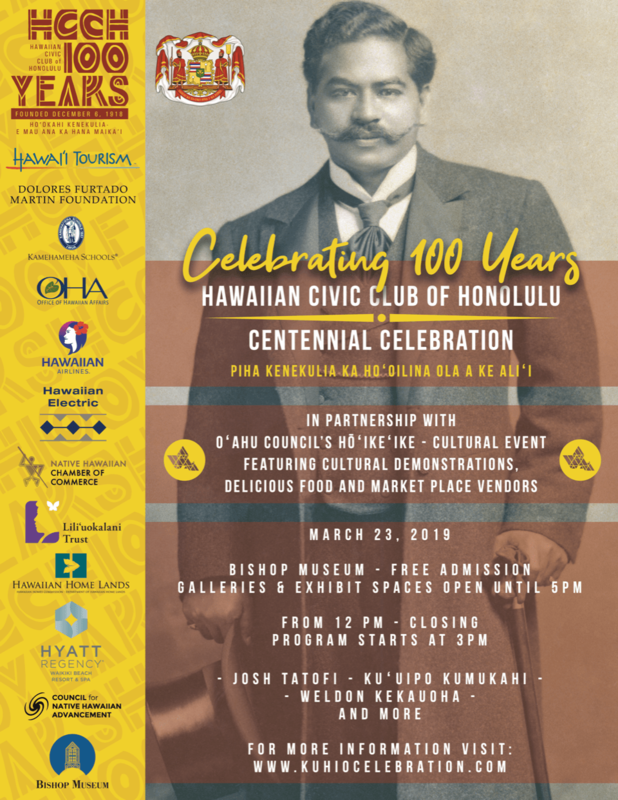 On March 23rd, 2019, the Hawaiian Civic Club of Honolulu will host a Centennial Hoʻolauleʻa showcasing 100 years of Hawaiian Civic Club accomplishments since the founding of the Hawaiian Civic Club movement by Prince Jonah Kūhiō Kalanianaʻole. Cultural demonstrations, ‘ono food, and educational displays will start at 12pm. Music program begins at 3 pm featuring Josh Tatofi, Kuʻuipo Kumukahi, Weldon Kekauoha and more. FREE Admission to local Kamaʻāīna begins at 12pm.